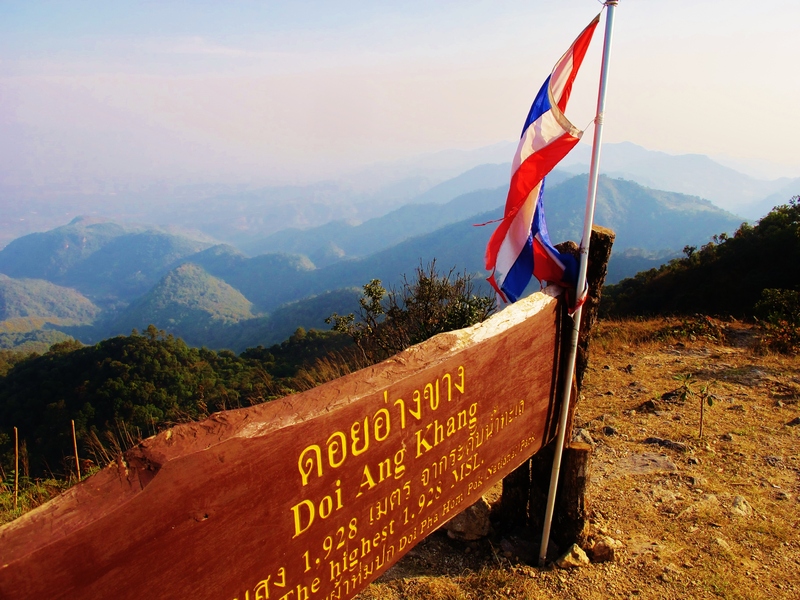 Doi Angkhang summit (photo taken in February 2015). Every birder has them – those supposedly “common” species that you have somehow never seen. My list of such birds in Thailand includes the infuriatingly regularly heard – but not yet seen – Collared Owlet and Mountain Scops Owl. the possibly overlooked Barred Cuckoo-Dove, and the enigmatic Blue Pitta. I didn’t want to leave anything to chance for my one-day visit to Doi Angkhang, for a concerted effort to finally get White-browed Laughingthrush on my list. I’ve visited this remote corner of northwest Thailand on a number of occasions over the years and it’s one of my all-time favorite birding sites. White-browed Laughingthrush is common in montane scrub in the area, and is apparently seen by most visiting birdwatchers – except me, that is. After careful research on the excellent websites North Thailand Birding and Thai Birding, I reckoned I should probably concentrate on the Ban Khoom Valley trail for my best chance. This happened to be an area I have seldom visited, so I was cautiously optimistic. 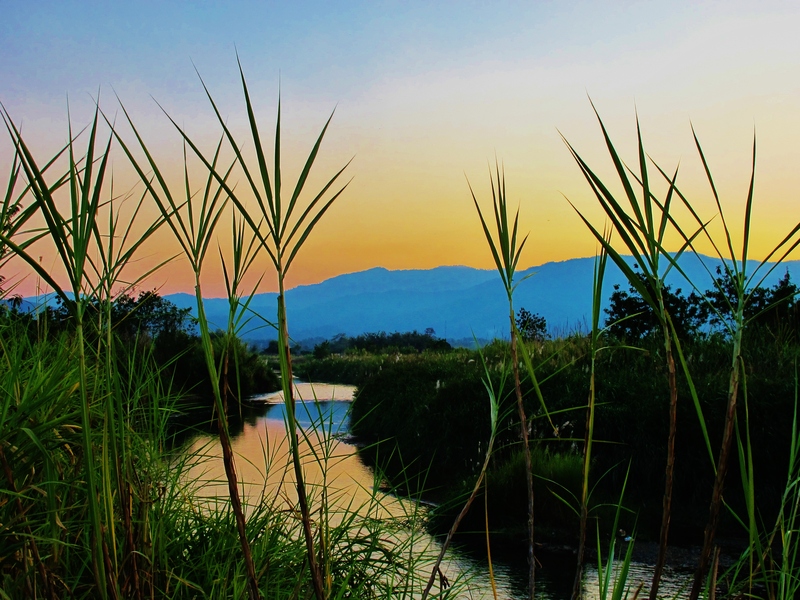 I started at the Ban Luang end of the trail, where the orchards were heavy with orange fruits and teeming with birds. I saw over 40 Crested Finchbills here, alongside numerous bulbuls of several species including the local speciality Brown-breasted Bulbul. To my surprise I kept hearing the thin “tsee” call of turdus thrushes, birds which I would not expect here outside the November to February winter season. Unlike the bulbuls, the thrushes remained low down in the orchards or on the ground, and it was hard to get the chance of views due to surrounding vegetation. Eventually I had brief views of what looked to be an adult female Black-breasted Thrush, a regular winterer here which breeds in neighboring countries and is the most likely of the three possibilities. I couldn’t absolutely exclude Grey-backed Thrush and Japanese Thrush on the views I obtained, but either of the latter two species would be very rare indeed. In any case, judging from the calls there were at least three, probably four, turdus thrushes present here – in all likelihood post-breeders from the nearby breeding ranges attracted to the area by a bumper fruit crop. A little further along the trail, areas of scrub and rocks on the left quickly produced the day’s target bird, White-browed Laughingthrush – and not just one, but about fifteen birds seen in various small parties. It never rains, but it pours. I had been expecting a skulker, but these birds perched up on rocks and bushtops and showed very well indeed. A quite unexpectedly easy tick. Other noteworthy birds in the general Ban Khoom Valley trail area included a Mountain Bamboo-Partridge, two Maroon Orioles and a Rufous-backed Sibia. With my target bird under the belt and the pressure off, I drove down to Km 24 and walked the Mae Per forest trail as far as the dam and back. This trail passes through excellent habitat and has a long list of mouthwatering but seldom-seen birds such as Red-tailed Laughingthrush and Pale-billed Parrotbill. It was quite “birdy” along here today, with several feeding flocks encountered, but nothing spectacular was seen although Ashy Bulbul was a year tick, and a pair of White-gorgeted Flycatchers showed well. After a spot of lunch in Ban Khoom, I went up to the trails at Km 21.5. Surprisingly, it hadn’t started raining yet although the afternoon was becoming increasingly cloudy and misty. Outside of the dry season, the trails here become increasingly overgrown or even impassable although I could just about get to the base of the summit trail. Generally hanging around for a couple of hours in the area produced some nice birds including Scarlet-faced Liocichla, a singing Lesser Shortwing in the dark forest that showed nicely for a few seconds, several groups of Silver-eared Mesias, and another White-gorgeted Flycatcher that approached me to within six feet as I sat motionless on the forest floor. Following this morning’s thrush sightings, another seemingly unseasonal bird was a male Mrs Gould’s Sunbird, which the literature suggests is only a winter visitor here – perhaps they also breed in small numbers? Lifer: White-browed Laughingthrush (total 1,966). 2015 Year Tick: Ashy Bulbul (total 832).